It was a pleasant surprise for me...saturday morning when i checked my mail..i happen to see Jay's comment on my space.."surprise waiting for you dear" I was so eager to check her link n It was bunch of awards she shared with me too n i was more happy to see my name on her list..And I am honored to receive these awards...thanks a ton Jay. Jayanthi from Tasty Appetite ,has shared me the following awards.Tasty Appetite,such a lovely space with more yum yum delights... particularly i love her Non-Veg recipes n i tired her chicken mughalai biryani sterday tat was so yummy n super hit..we all loved it ..Thanks a lot Jay for the recipe and as well for the awards.Plz do check her space n leave your lovely thoughts n keep encouraging us.. I took this opportunity to thank my blogger friends who also shared some awards withe me earlier...When i got my first award from Malar from KitchenTantra...i was so much pleased and don't have enough words to thank her...because that time i was new to this blogging world with less or no friends..upto my 145th post i don't have visitors (from other blogs) none to comment or encourage me...but i was going with high spirit without expecting but yearn lot for appreciation to share...Malar only encouraged me a lot and she said ..you have a very good space with wonderful recipes..don't worry I will visit your blog often or whenever i find time ..That few words were really encouraged me n after my 150 th post i got so many friends..And i am very thankful to all. I want to thank Menaga (Sashiga) who also shared some awards with me earlier...She is also a good friend of me n a nice person...I love her space a lot n she has lots of diet recipes n more interesting and easy to do recipes ..don't forget to visit her space also. I would like to thank all my Blogger Friends for your constant support and encouraging..I mentioned these names as a token of my love n gratitude...Without mentioning your names i am always thankful to You Guys..You all made my Day :) Keep Rocking!!! Congrats again for ur Awards...Keep Rocking!!! congratulations! And thank you so much for thinking of me! It was very sweet of u.
Congrats on ur awards Sangee, u deserve it dear..
Congrats on ur awards dear..Thanks a lot for sharing them with me.Nice to know more about u.. So sweet to know more about u..! 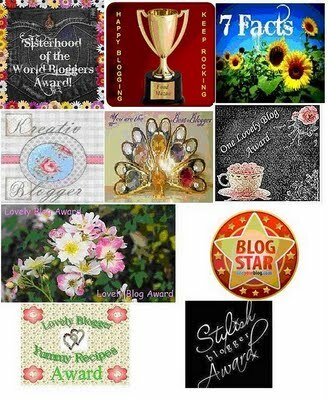 Congrats Sweety.. U really deserve them.. U have no idea what a wonderful blog u have :) I have always enjoyed reading ur space.. Thanks a ton for sharing your happiness with me. You made my day! Hugs! Again congrtas on ur awards dear! !